Arturia has announced the KeyStep, a portable USB MIDI keyboard with a built-in polyphonic sequencer. IK Multimedia has released the iRig Keys MINI, a new, ultra-compact universal MIDI controllers. 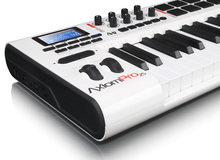 IK Multimedia has announced three new MIDI keyboard controllers designed with mobile Mac & PC musicians in mind.